input that strategy through the keyboard and play out the action on your TV screen. 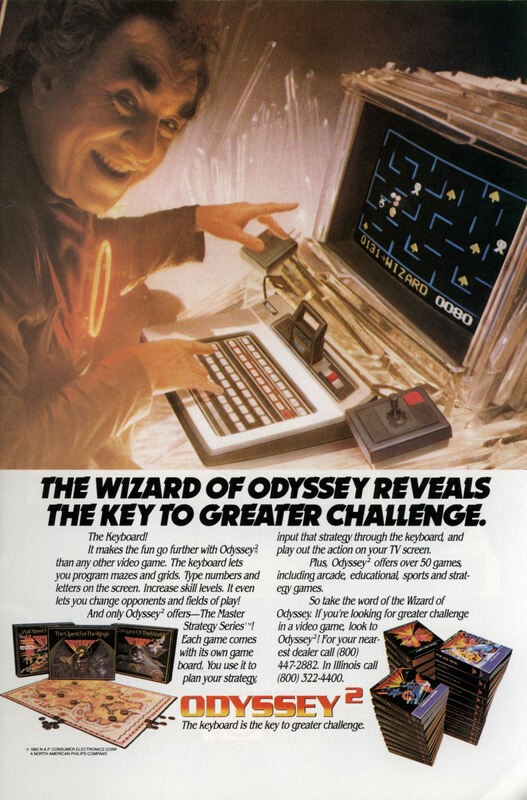 Plus, Odyssey2 offers over 50 games, including arcade, educational sports and strategy games. So take the word of the Wizard of Odyssey. If you’re looking for greater challenge in a video game, look to Odyssey2! For your nearest dealer call (800) 447-2882. In Illinois call (800) 322-4400. The keyboard is the key to greater challenge. Is that Eyebrow Guy from Dune? Is that the alien traveling salesman from Space 1999? Is that the Tribble salesman from Star Trek? jayessell » I can see the Thufir Hawat thing, but Cyrano Jones? Yep, Iron Mans dad is sure creepy! Maybe what we should be asking is, why is he in The Fortress of Solitude? I’m getting a strong Jay Robinson/Doctor Shrinker vibe from this guy.